The 3rd annual Bedford Cup, featuring the top collegiate men's and women's tennis players from all NCAA Division I tennis programs in the state of the Florida, will be held on Sept. 26-29, 2013, on the campus of Florida State University. Last year's event, held at the University of Florida, saw UF's Gordon Watson win the singles title, while Andres Bucaro and Benjamin Lock of Florida State won the doubles championship. Watson, a redshirt freshman playing in the second tournament of his collegiate career at the time, defeated North Florida's Moritz Buerchner 6-3, 3-6, 6-3 in the final. Buerchner won the inaugural singles championship in 2011, which was held on the campus of USF. In last year's doubles final, Bucaro and Lock defeated Mike Alford and Florent Diep of the University of Florida 8-5. Last year the event welcomed a total of 64 players from UF, Bethune-Cookman, Florida A&M, Florida Atlantic, Florida Gulf Coast, Florida State, Miami, North Florida, Stetson, Central Florida and South Florida competing in both singles and doubles. The Bedford Cup is sponsored by the Youth Tennis Foundation of Florida, with additional funding provided by the Edward T. Bedford Foundation. The 2013 event will feature a women's division for the first time. For more event information go to www.ytf-fl.org/YTF%20Mens%20Intercollegiate.html. 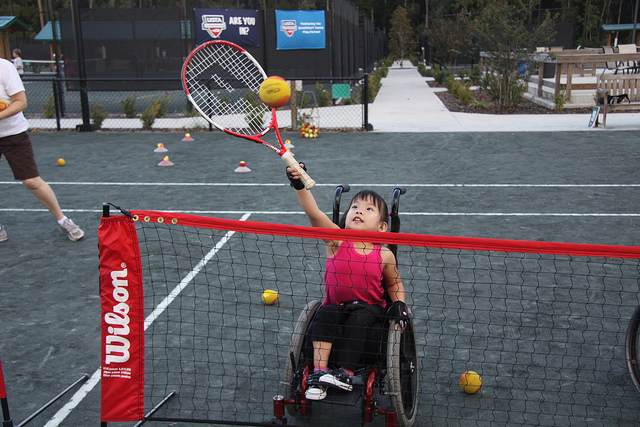 The deadline for USTA national grants for adaptive tennis programs for the remainder of 2013 is Oct. 18 from USTA Serves, the official charitable arm of the USTA. USTA Serves awards program grants twice a year to programs that support at-risk youth and people with disabilities through tennis and education programs designed to improve health, build character and strive for academic excellence. To date USTA Serves has granted more than $12 million to fund 247 programs in 184 cities in 47 states, including more than $900,000 to adaptive tennis and wounded warrior programs for people with disabilities. * All applications must be submitted online. * Offer college preparatory sessions. For additional information about submitting a grant proposal, visit www.grantrequest.com/SID_527?SA=AM or e-mail foundation@usta.com.